The “Niagara of Mexico” is a natural waterfall on the River Santiago as it winds its way from Lake Chapala to the Oblatos Canyon, the deep ravine which prevents the city of Guadalajara from expanding further northwards. Between the small villages of El Salto (The Waterfall) and Juanacatlan, 17 kilometers east of the Guadalajara-Chapala highway, is the second biggest waterfall in North America, the biggest being Niagara. A bridge with 24 arches spans the falls and links the two villages. 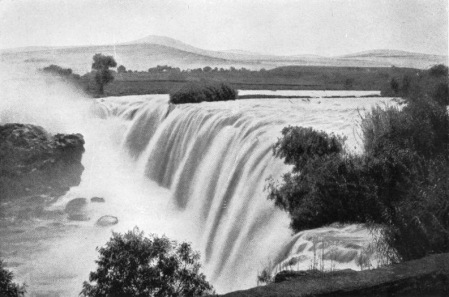 The falls became part of Mexican postal history in 1899. The Juanacatlan falls are shown as a waterfall of immense beauty, a conclusion echoed by tourist guides of the time which speak of a “magnificent spectacle” and the “majestic falls”. Despite their former fame, the 35-meter-high falls were reduced in the 1980s to a trickle of dirty, evil-smelling effluent from local factories. 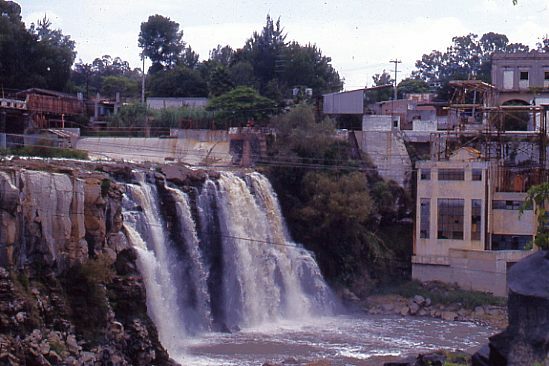 Next to the falls, which at the turn of the 20th century provided hydro-electric power for Guadalajara, now stands the empty shell of a cotton and woolen mill whose wheels were once turned by the falls. Hopefully one day these historic falls will be restored to their rightful place as one of Mexico’s greatest tourist attractions. This is an edited excerpt from Tony Burton’s Western Mexico, A Traveller’s Treasury (4th edition). All rights reserved. Congratulations! We hope you will find other Geo-Mexico.com posts useful in your studies!